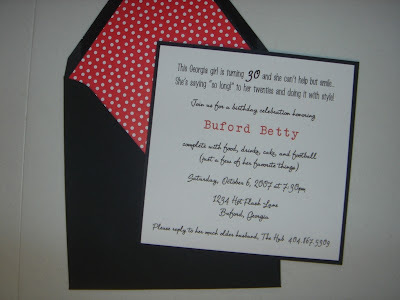 Buford Betty: A party's in the works! I had to force myself to get these invitations done today, seeing as my 30th birthday bash is less than 4 weeks away... and aren't they the cutest?! SO fun! I've got some addressing to do tonight. Kuntry bride is doing the same with her wedding invitations. She keeps calling me today asking how to address certain envelopes. Oh man I don't envy her one bit. I love putting together invitations but I hate addressing envelopes. The first two or three are fun, but it gets really old really fast. So I've got a date with a silver pen and MTV tonight. Is anyone else dying to see the train wreck that is Britney Spears perform tonight? What a mess. I love that girl. Love, love, love! So birthday and bulldog-a-rific!